So yesterday was the first day of the rest of Chris Cerf's life: the former NJ Education Commissioner left his post to take a job at Amplify, the Rupert Murdoch-owned company run by former NYCDOE Chancellor (and Cerf's former boss) Joel Klein. Amplify sells tablet computers designed, among other things, to help districts prepare their students for the Common Core-based tests Cerf has pushed so vigorously. Except, as I argued earlier, those rules are so lax and poorly enforced they may as well not even be in place. But let's leave that aside and concentrate for a minute on Cerf's contention that he's really not sure if Amplify is doing business in New Jersey: "I can’t say with any measure of certainty now, but I suspect the answer is yes." MOUNT OLIVE TWP. – The school district is continuing its inexorable march toward the time when books will be a quaint memory to students. The latest technological advance involves the district’s purchase of 450 computer tablets for use by all freshmen and their teachers. The tablets, made by Amplify of New York City, cost the district around $200,000, according to Schools Superintendent Larrie Reynolds. Hamilton said Amplify will continually provide online and on-sight technical support. He said the Amplify system is the most advanced school system on the market. He said the district hopes to provide tablets to all students over the next three years. This article is from back before the 2013-14 school year started. Mt. Olive is the first district in NJ to use Amplify products. And it just slipped Cerf's mind that Mt. Olive had bought the tablets, and was looking to purchase more -- even though Cerf has worked closely for years with Larrie Reynolds, the superintendent of Mt. Olive. 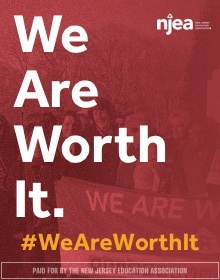 Public education in New Jersey has been roiled recently by conflicts over charter schools, vouchers and "virtual" schools — but, now, a new type of privatization is on the horizon: allowing public schools to contract with a private company to offer "alternative" education. The idea has been promoted to school superintendents by one of their own, Mount Olive schools chief Larrie Reynolds. He says it could bring extra income both to cash-strapped school districts and to a private, Dubai-based company for which he works as a consultant. Reynolds is a friend and former employee and business associate of acting Education Commissioner Christopher Cerf. Reynolds, who calls Cerf a "magnificent man," recently appeared with Cerf and Gov. Chris Christie on a panel to discuss school reform. Cerf says he knows Reynolds was "in the early stages of thinking about a program that would serve alternative education students drawn from multiple districts." He says he is unaware "of the specifics of his ideas." Cerf has known Reynolds for years — hired him twice — and the relationship provides a glimpse not just into the growing political brawl over privatization, but also into the network of entrepreneurs who use longstanding contacts in both government and the private sector to try to make money on what had been a public monopoly. Under Reynolds’s plan, a company he says that he represents as a consultant — GEMS Education — would help a school district apply to the commissioner to become a "district of choice" under a newly expanded inter-district choice law, allowing it to admit students from other communities. The law gives the commissioner the power of approval. He also is president of Sangari Active Science, a subsidiary of Sangari Global Education, a company once run by Cerf. Reynolds also headed Newton Learning, a division of Edison Schools, a private education management company Cerf served as chief operating officer. A little over a year ago, I wrote about the relationship between Reynolds and Cerf. It turns out the "alternative education" Reynolds wanted was a variation on the increasingly popular Interdistrict Choice program. The problem, according to a report in the Mt. Olive Chronicle, was that Reynolds plan fundamentally changed the purpose of Interdistrict choice, at least according to the legislator who wrote the law, Mila Jasey. Mt. Olive eventually withdrew its application, and the district gave up potentially $2 million in revenue. Further: you won't find Mt. Olive listed as one of the participating choice districts for 2014-15, and Sunset Academy is now a twice-a-week after school credit recovery program (at first glance, that looks to be a good idea). So it appears that NJDOE bent over backwards to get Reynolds's program approved, but he didn't go through with it after all. Right from the district's website: "herald a new era of learning" and all that. You can scroll down and find Amplify promotional materials hosted on the district's own website -- not links to Amplify's servers, but the school district's. Of course, you can go over to Amplify's website and read all about the Mt. Olive program as well. I'd show you the picture of Mt. Olive's kids wearing Amplify t-shirts, but that might violate some intellectual property laws or something. Cerf, by his own admission, "fended off for quite some time" the offer to come to Amplify. Cerf and Larrie Reynolds have known each other and worked together for years. Reynolds's district, Mt. 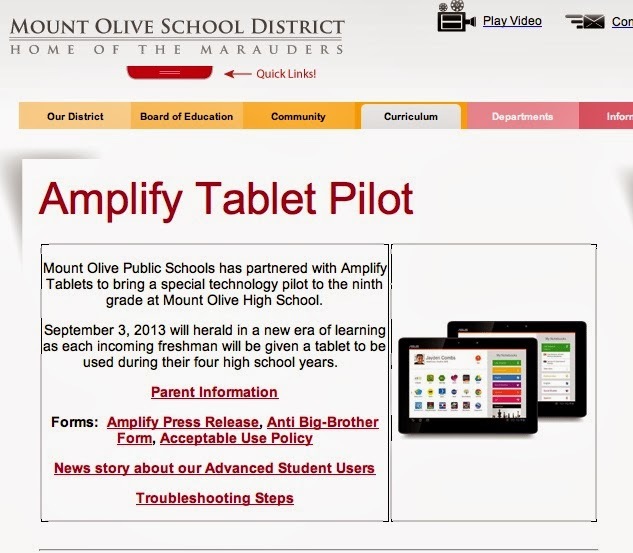 Olive, is the first in the state to use Amplify tablets. Cerf implied he didn't know specifically that the largest and second largest districts in New Jersey have deals with Amplify. Now he wants us to believe he didn't know about a similar deal with Mt. Olive, whose superintendent he has known and worked with for years and who calls him a "magnificent man." If school districts struggle with the implementation of the new standards, and test results plummet as a result of a mishandled transition, guess which company would be able to exploit those struggles by offering its services? Amplify Insight. A two-year ban on Cerf and Amplify doing any business with New Jersey schools should be in order with Cerf on board. We'll get to the incoming Education Commissioner, David Hespe, in due time. But let's take one last moment to appreciate the legacy Chris Cerf leaves behind here in New Jersey. Because I really can't think of a better story than this one to sum up the last three years. All the best, Mr. Cerf. Christopher Cerf, NJ Education Commissioner, 2011-2014. Larrie Reynolds is the superintendent of Mt. Olive schools and he represents GEMS Education, as a consultant. AND he is president of Sangari Active Science, a subsidiary of Sangari Global Education, a company once run by Cerf. Reynolds also headed Newton Learning. Call me crazy but conflict of interest and self serving double, (triple) dipping come to mind. Jazzman - Cerf worked for Klein in NYC. Amplify is the former Wireless Generation - really innovative and well respected. They built ARIS for NYC after IBM botched the initial work. Founded by two Rhodes scholars. Super impressive organization. So of course they stay in touch - "fended off for quite some time" no doubt means that Cerf heard about exciting things happening in the world of edtech - which, as you point out, is a hotbed of innovation right now. Amplify publishes the Core Knowledge series for elementary and middle ELA - huge research base and a very exciting new product. Any NJ school evaluating their literacy program in 2014 would consider it. So the scandal here is...what, exactly? Where in the equation is something improper happening? Some people who know Cerf adopted a literacy program headed by somebody who also knows Cerf? I mean, take a look at any random LinkedIn page - people in the professional communities network with each other. Do you have any evidence that these contracts were improperly bid? If you don't, stop implying that people broke laws - those are serious allegations. "... Wireless Generation - really innovative and well respected." Really? "Amplify is the new name given to Wireless Generation, a Brooklyn consulting firm best known in New Jersey for the $500,000 it received in consulting fees to put together the state’s application for $400 million in Race to the Top money. The application was denied because of clerical errors and some New Jersey legislators blamed Wireless Generation’s work and demanded it return the fee." Wireless Generation, it seems, is not so well respected in NJ. "Let's stop a minute and regroup. There is nothing wrong with a school district giving a contract to a tech provider. There's a nothing wrong with using tech in the classroom; I do it all the time, and I'll be the first to admit it's the wave of the future. I don't know the Amplify products from squat: maybe they're fantastic (although I will always be wary of anything that comes out of the same corporate mothership as Fox News and the NY Post)." "Chris Cerf's shuffling between the private and public sectors is perfectly legal and perfectly normal; that, of course, is exactly the problem." So, no, I didn't imply or state otherwise anyone broke any laws - in fact, quite the opposite. As I said explicitly, this is all perfectly legal. And that's the problem. More later. Hadn't read your revolving door post yet, so my wording is a bit off - maybe you're not accusing him of anything in violation of NJ law, as written, but you're definitely accusing the man of unethical behavior. I think it's quite a stretch - a laughable stretch - to call NJ's education system a revolving door. Look at Obama's Council of Economic Advisers - some from industry, some from government. Is that a revolving door? You want people with a variety of backgrounds. And you want the press and the media scrutinizing their behavior. I ask again: what evidence do you have that Cerf has done anything remotely wrong in his interactions with Amplify? The fact that some districts in the state use it is anything but evidence - schools all over the place use it. Re: Wireless Gen, I encourage you to read about their background. City officials said the state's federal application specifically cited ARIS as a template that it wanted to expand statewide. "The state’s system is modeled on ARIS, and we are working with them closely on its development," Hughes said. 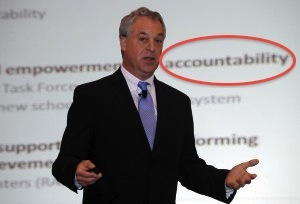 Also re: ARIS - when I taught in NYC the system was a legacy product called ATS (Automate the Schools). ARIS was a huge step forward from that. I am currently president of the Education Association of Mt. Olive, and can tell you that Mr. Cerf has been to our district at least twice since the inception of the Amplify program and has seen it in action--or not, as it is down more often than it works--so his contention that he is unaware of any districts using the program is unmitigated fantasy. Steve, can I confirm this is really you? Email me at the address in the left-hand column, if you would. Thanks.